MSS Inc. Releases New Optical Sorting technology, L-VIS™- New High-Resolution Color Camera Sorting System for Shredded and Granulated Materials | MSS, Inc.
NASHVILLE, Tennessee – MSS Inc., a world leading manufacturer of optical sorting equipment, recently introduced a new high-resolution color camera sorting system for small particle applications, such as shredded and granulated materials – the L-VIS™. 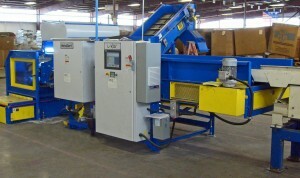 The L-VIS™ is designed for color-sorting applications such as shredded electronic scrap to extract high-value commodities (printed circuit boards, copper, etc). It provides excellent separation accuracy (up to 98%) and is available with a proprietary shape identification software algorithm specifically designed for sorting wires. The L-VIS™ can also automatically sort plastic granulates, pellets and flakes by color. An all-metal detector for ferrous, non-ferrous and stainless steel can be added for further sorting applications. The L-VIS™ can be easily configured by the operator via a touchscreen interface and is offered in three sizes: 800mm (32”), 1200mm (48”) and 1600mm (64”).